In Death Valley, California, two military choppers investigate an impact crater. The cause of the crater isn't immediately known, until the culprit leaps clear into view - and through the windshield of one of the choppers. It's not some fallen chunk of space rock. It's the mighty Mongul. In the Fortress of Solitude, General Zod, who has mysteriously appeared as an apparition, explains to Kal-El his tragic tale of wanting to help Krypton only to be jailed in the Phantom Zone by Jor-El and the rest of the Kryptonian Council. Zod tries to spin the events of Krypton's destruction so as to lay blame on Jor-El, accusing his jailer of refusing to warn the people of Krypton. The AI Jor-El insists the rest of the Council refused to heed his warnings of the planet's impending doom, leaving Jor-El no choice but to ensure the survival of the one thing he cherished most - Kal-El, his son. Back in Death Valley, Mongul's confrontation with the military is interrupted by Superman. The two powerhouses duke it out to the awe and amazement of the onlookers. This is Superman's first appearance, and it doesn't seem clear whose side he's on. To General Sam Lane, both are a threat and need to be snuffed. The method: a warhead. Story - 2: Well, I took a bite and the meat's a little dry. What's worse, I thought this was a new dish but it turns out I've eaten this before. I'm fine with still not quite knowing how Zod appears in the Fortress, but I'm less fine with hearing yet again the story of his conviction and sentencing to the Phantom Zone. Maybe if that same story hadn't just been retold in Man of Steel I'd be more flexible. I'm also not very struck by the skeletons in Jor-El's closet, as the end of Part One suggested we'd be getting. Jor-El warning the Council, the Council ignoring him, and Jor-El sending little Kal-El to Earth are not skeletons. They're the foundations of Superman's origin story, and like Zod's story, we've heard it all before. I'm uncertain what Krul is trying to tell us here. Is all this a simple review, just in case we'd forgotten? 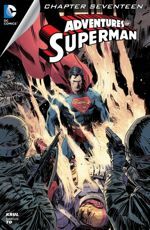 Is he telling these story elements for readers new to Superman? 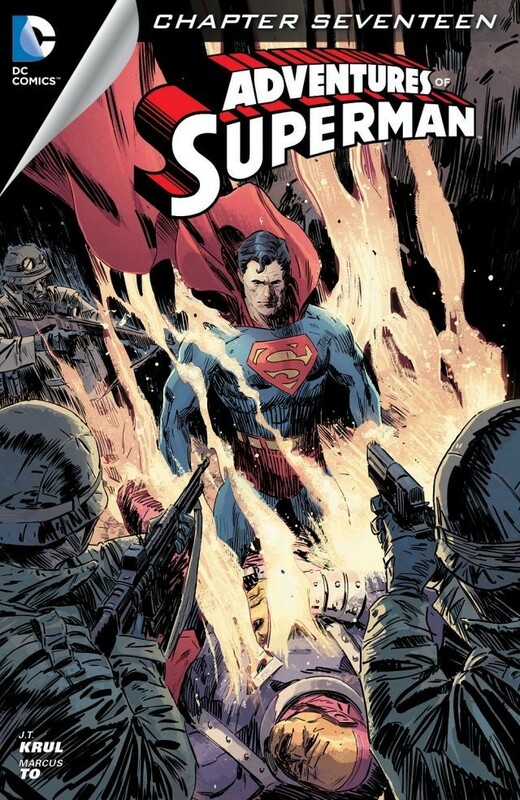 I suppose that could be forgiven, but that still leaves me to review the story as a weathered Superman fan, to whom all of this is an old hat. As a weathered fan, it was all rather jejune, if not entirely tedious. I had some trouble taking in the idea that this was Superman's first appearance, or at least the first time the military caught sight of him. I'm not opposed to the idea that this was the first time he made his presence known, but to the jerky way in which it's presented in the story. It's clear from Part One that Superman has been out in the world doing superheroic deeds, all in costume. The revelation here in Part Two then that Superman has done those things unseen is clumsy. If some suggestion was made earlier, preferably in Part One, that no one is yet aware of Superman's presence despite his deeds, then the surprise of Sam Lane and the soldiers in Part Two would have come across more smoothly. It reminds me of the set up in The Simpson's "Treehouse of Horror III" when Homer is telling a scary story. "Then he came through the door!" Homer exclaims. "So?" everyone questions. "Didn't I tell you he was dead?" "No," Bart groans. Krul sort of did the same thing to us here. Ultimately, this is a tired little installment that plays it so neat n' tidy that the sheen is obtrusive. Art - 4: Marcus To stepped up a little bit in this issue. He took his usually great art and stretched it a tad farther. The action scenes look particularly good.